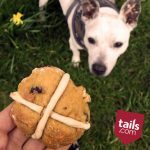 We all love Easter weekend here at tails.com HQ. A few extra days off work to get some tasks done and definitely catch up on some much needed relaxation. It’s also a treat for our dogs, who get extra one-on-one time for cuddles and extended walkies. 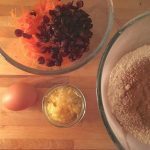 We thought this would be a good time to do a spot of baking for the special canine in your life, and as there’s a bit more time we’re giving you a slightly more labour intensive recipe this month. We’ve run this recipe by the dogs in the office and they all agree, they think us dog owners are more than up to the challenge. Office dog Bandit has requested we make some hot cross buns. The best part is, the ingredients are all human friendly so you can enjoy them too. 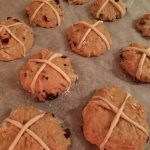 Traditional hot cross buns include raisins, which we need to very careful to exclude. Raisins are incredibly dangerous for dogs, and should never be given for treats. We’ve substituted the raisins for carrot which, although might not seem very interesting for us, dogs absolutely adore. Carrots are high in vitamin A and beta-carotene, which both provide benefits for your dog’s healthy eyesight, as well as healthy skin, coat and immune system. * Sift the bread flour and cinnamon into a bowl, and then add the butter and knead together to create breadcrumbs. * Create a circular well in the centre of the mixture and add in the yeast, honey and lemon zest. * Take another bowl to beat the egg and milk together for about one minute. Pour this mixture into the circular well in the other bowl. Mix together until a dough is formed. 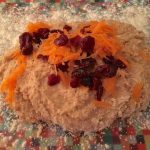 * Place the dough on a lightly floured surface and knead for a few minutes, slowly adding in the grated carrot and cranberries. Then shape the dough into a ball and pop back into the bowl, cover the surface with a tea towel, and place it in a warm place for one hour. * Pop the dough back onto your floured work surface and gently knead down in the centre. Shape into a ball again and put back into the bowl. Cover again, and leave for another thirty minutes to rise. * Turn out the dough again on the floured surface and divide into 12 individual pieces. Place the 12 pieces onto a greased baking tray and flatten them into a bun shape. * Mix the plain flour with a few teaspoons of water until you can make a light dough. Taking small pieces of dough, roll between your hands to make thin pieces a few inches long. 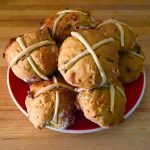 These can be laid on top of the buns to create the crosses. * Place into a pre-heated oven set at 220°C, gas mark 8, for approximately 12-15 minutes until nicely golden. Once baked, paint the buns with a thin layer of honey. The set the hot cross buns aside on a wire tray to cool. Last but not least, make a cup of tea, settle down to watch a movie and share a hot cross bun with your dog. Happy Easter!